Baylor's Bryce Petty and UCF's Blake Bortles both exceeded 3,000 passing yards to rank among the nation's most prolific quarterbacks. With the College Football Playoff coming next year, No. 6 Baylor and No. 15 Central Florida are set to meet in the final Tostitos Fiesta Bowl of the BCS era on New Year’s Day. The matchup has been ridiculed a bit for what appears to be a mismatch, and the pairing has been attributed to the Fiesta Bowl having the final at-large selection, for which it had to choose UCF since the Knights earned an automatic BCS berth. It’s one final game for BCS critics to gripe about, and one more chance for the Fiesta Bowl to serve up a BCS upset. Recall the 2007 Fiesta Bowl, in which No. 8 Oklahoma was widely expected to cruise against Boise State, who ranked ninth but had played a Western Athletic Conference schedule. Boise State won the game in overtime in one of the most memorable bowl games ever. On the flip side, there was the Oklahoma-Connecticut game of three years ago — a mismatch that lived up to expectations with a 48-20 win for the Sooners. Could UCF be the next Boise State on the BCS stage? 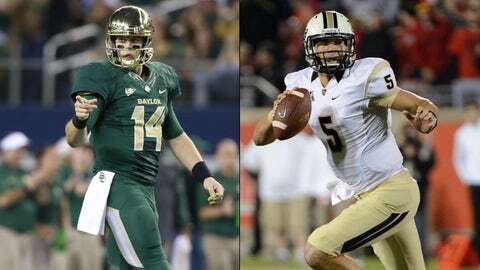 Or will Baylor overpower UCF with the nation’s top offense the way Oklahoma did to Connecticut? The teams have a month to scheme and prepare, but here’s an early glimpse at the matchup. Scouting report: High-powered offenses have become more and more popular in recent seasons, but Baylor has taken it to another level with its nearly point-per-minute scoring attack that hasn’t slowed a bit since Robert Griffin III took his Heisman Trophy to the NFL two years ago. The Bears lead the nation in scoring and total offense, and topped 70 points in a game four times. The knock on Baylor in recent seasons has been its lack of defense. Not this year. Baylor ranks in the top 20 in scoring defense and total defense, having held all but four opponents under 30 points. Baylor landed five players on the All-Big 12 First Team, including the dangerous offensive trio of quarterback Bryce Petty, running back Lache Seastrunk and receiver Antwan Goodley. Last game: The Knights capped a school record eight-game winning streak with a 17-13 win over SMU. Scouting report: UCF takes heat for playing in the American Athletic Conference, a league many believe should not have an automatic BCS bid, but the Knights handled whatever came their way. After a three-point non-conference loss to South Carolina, UCF rattled off eight straight wins, including one over then-No. 8 Louisville. The Knights don’t dazzle with a high-powered offense or gaudy scoring numbers but have been efficient behind junior quarterback Blake Bortles. UCF won seven of its games by a touchdown or less. That’s a credit to the UCF defense, which ranks 13th nationally in scoring defense and 19th in total defense. UCF’s rushing defense ranks 13th in the nation, and its red zone defense ranks ninth. — Both schools are playing in their first BCS bowl game. That should be a draw for the teams’ fan bases, though many assume UCF will not travel well because of the distance between Florida and Arizona. Fiesta Bowl executive director Robert Shelton expressed confidence that won’t be an issue. The BCS first also presents new preparation challenges for both teams. BCS bowls come with more attention, more media responsibility, more practice time, more team activities and more scrutiny. Both coaches feel prepared for the bigger stage. — Both coaches have built their programs up from the bottom. UCF struggled to gain footing after moving to the FBS in 1996 and went 3-9 the year before O’Leary arrived. O’Leary’s first team went 0-11, but that was quickly followed by an 8-5 mark, an appearance in the Conference USA title game and the school’s first bowl game. Since, UCF has won three conference titles and appeared in four bowl games. Briles, meanwhile, was tasked in 2008 with fixing a program that had not had a winning season since 1995 and failed to win more than five games in a season since joining the Big 12 in 1996. In 2010, Briles led Baylor to its first bowl game since 1994. The Bears won the Alamo Bowl in 2011 and Holiday Bowl in 2012 and this year captured its first conference title in 33 years. — The game should feature a strong quarterback matchup. Baylor’s Bryce Petty was part of the Heisman Trophy conversation for part of the season and finished the year with 3,844 passing yards (seventh most in the nation) and 30 touchdowns (tied for ninth in the nation). The junior is averaging 320.3 passing yards per game (eighth in the nation). UCF junior Blake Bortles has been getting increased attention lately as perhaps one of the top quarterbacks available in the next NFL Draft should he enter. Bortles ranks ninth in the nation in passing efficiency, 18th in passing yards per game (273.3) and 19th in passing yards (3280).